We have all had one: you, me, everybody. The Great would-be Pilgrimage. That Special Trip that never happened. That Wonderful Journey that somehow got away. Some of us have yearned to sojourn in Jerusalem and the Holy Land. Or perhaps one dreams of someday embarking on that sacred once-in-a-lifetime Hajj to Mecca. I can well relate to this feeling of wanting to go somewhere where I feel like it's my life calling to go! But for me, that so-far missed opportunity has been to partake in a far different kind of celebrated ritual. 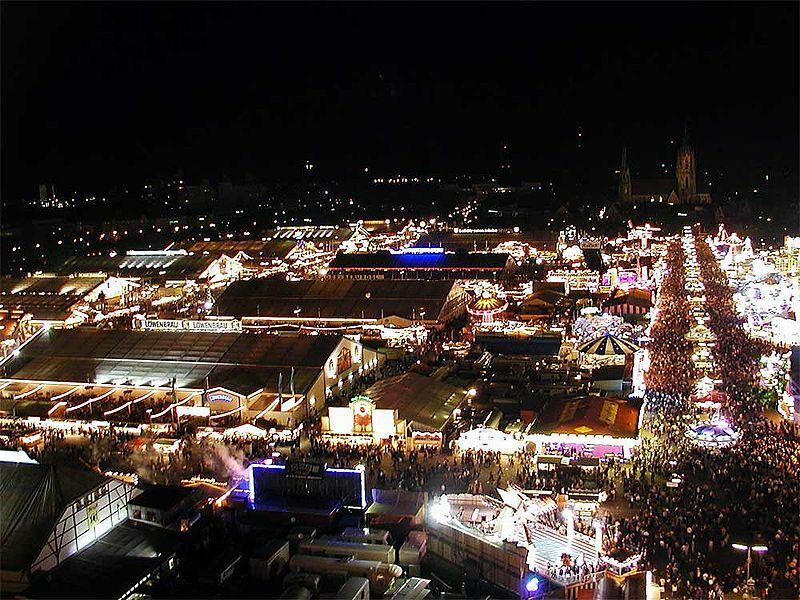 That celebration is none other than the world-famous Munich Oktoberfest. So far in my now middle-aged life I have thus far in vain attempted to convince my loving but skeptical wife to consider accompanying me on a sacred mission to that greatest of all beer parties to behold on this Planet Earth. Unfortunately, she is acutely aware of the darker side of the event: the suffocating crowds, the rampant drunkenness, the uncivil tendency of some revelers to use discarded mugs as portable restrooms.....all of these factors have served to be an all-too effective deterrent to her desire to participate in what she considers to be an alcohol-fueled anarchy. How could she possibly wish to miss out on such fun? But for now, I will content myself to view and admire the celebration from afar. Fortunately, one does not necessarily need to travel to Munich to appreciate the finer side of what Oktoberfest has to offer. 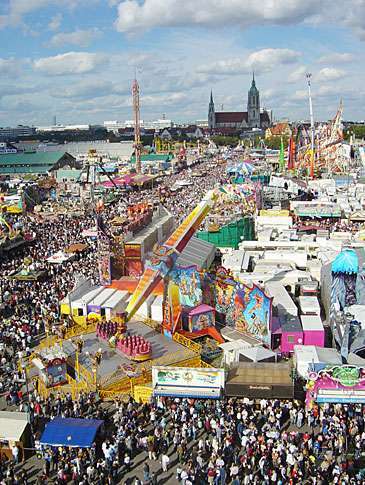 The Oktoberfest event itself is now celebrating its two hundredth anniversary. It traces its origins to 1810, coinciding with the marriage of the Bavarian King, Max Joseph (who was later King Ludwig I) to Princess Therese von Sachsen-Hildburghausen. Although its name implies an October event, the majority of the festival actually occurs in the last weeks of September, and normally concludes on the first Sunday in October. It is generally conducted under incredibly massive tents, designed to house and feed literally tens of thousands of giddy celebrants, replete with oom-pah bands and legions of buxom barmaids with large plates of bratwursts and pretzels, and huge liter steins of rich amber lager beer. Ah, the beer. Now we're getting to the heart of the matter! 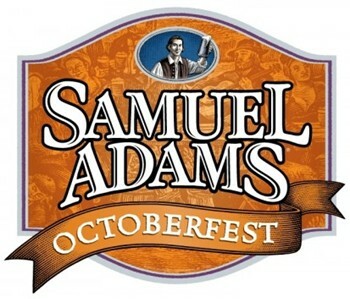 It may surprise one to learn that the full-bodied brew that is usually served at Oktoberfest is not named for the month of October, but that of March! The official name for the lager beer is Maerzen, named not for the month in which it is served, but the month in which it has been historically brewed. Traditionally, beers for this festival were laid down to condition under near-freezing temperatures for a full six months before they developed the stylistic smoothness of flavor they are famous for. Before the advent of modern refrigeration, this conditioning was carried out by storing the beer in icy caves. No doubt many modern brewers have skipped back from this traditional six-month conditioning time, although a thorough maturation period is still essential to attain the proper character. The world's original example of the modern Oktoberfest style of beer (and to many beer lovers the very best) is the exceptional Ur-Märzen of the Spaten Brewery of Munich. “Spaten” means “spade” in German and the brewery's logo appropriately features two malt shovels side by side. 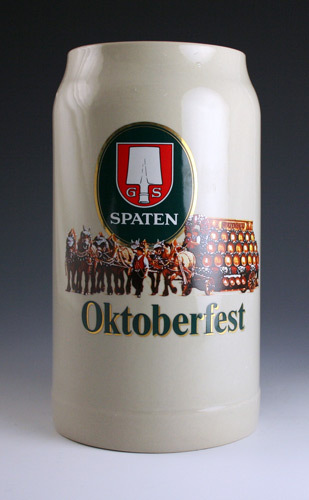 Spaten Ur-Märzen was first brewed in 1872 and is still the benchmark against which other Oktoberfest beers are judged. Spaten has a deep amber color, and features a rich semi-dry maltiness with just a tantalizing compliment of sweetness that is not overdone. To balance this maltiness is a judicious addition of noble-type European hop varieties such as Hallertau and Tettnang: just enough to balance the mild sweetness, not to mask it with excessive bitterness. This makes it a remarkably quaffable brew that invites copious consumption, despite its rich flavor and higher-than-average alcohol percentage of about six percent by volume. Another fine German Oktoberfest beer that merits an honorable mention is Paulaner Oktoberfest, also of Munich. Paulaner is the brewer of its own prototype standard beer, the famous Salvator Doppelbock, but its interpretation of the maerzen style of lager is also worthy of high praise. Like Spaten, Paulaner Oktoberfest features a moderately dark amber hue, but is a tad sweeter in its maltiness than its famous cross-town rival. Its wonderful balanced character is similarly inviting (and dangerously so!) to the temptation to chain swill it. Approach this seductive brew with caution, unless you are properly strapped into your seat! Here in the U.S.A., a number of craft brewers have concocted their own versions of the Oktoberfest style. There are several fine examples, although they are hard-pressed to match the uniquely rich malty character of their German counterparts. This is because many German brewers insist on maintaining a time-tested technique in brewing that is known as decoction mashing. In decoction mashing, a thick portion of the barley malt mash is actually removed from the main kettle during brewing and is separately boiled in a separate kettle, and is then returned to the main mash. This process imparts a depth of malt flavor and character that is not possible with the simple infusion mashing (soaking the malt grains in one kettle, or mash tun, in hot water) that is practiced by the vast majority of American brewers. However, there are still a number of excellent versions, brewed by such stalwarts of the Yankee craft brewing industry like Samuel Adams and the Brooklyn Brewery. But perhaps my favorite American interpretation of this style is produced by the Harpoon Brewing Company of Boston and Windsor, Vermont. 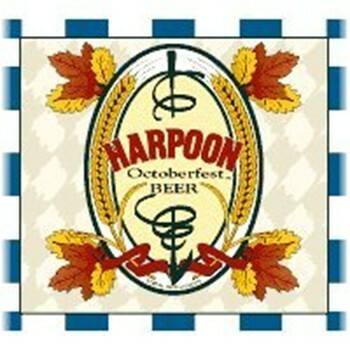 Harpoon Oktoberfest features a very pleasant, only slightly sweet richness of malt character. It has slightly more hop flavor than the standard for German maerzen beers, but the crisp spiciness that the hops impart creates a balance of flavor that makes for what one might call a remarkably egalitarian drinking experience. I have noticed that more and more in recent years, the classic German maerzen-style Oktoberfest beers have been increasingly difficult to find on many local store shelves near where I live. The mass proliferation of American “micro brew” beers has resulted in a vigorous competition for the limited space available in stores. As a result, the German Oktoberfest beers have become a somewhat rare commodity. It would be a shame to see those beers disappear completely, because they are paragons of the brewing craft and deserve their proper homage. But at the very least, what the American brewers can do is to heed the lessons the Germans have taught us about what it takes to produce a classic festival beer. If it tastes good enough over here, then maybe I can put off that sacred pilgrimage for a while!